Using proven DVD-RAM technology, the Panasonic LF-D201E storage device can hold up to 9.4Gb of Sonar 2031 Time/History data on a single DVD-RAM disk - 4.7Gb per side. The Sonar 2031 Time/History data is logged during normal operational use and used for post-operational analysis - a facility that was previously provided by DICARPS. With a quoted data transfer rate of up to 8.3MB per second, and seek time of 75ms, the SCSI variant of the Panasonic DVD-RAM family was chosen by Curtis Technology for several reasons. Firstly, the DVD-RAM drive allows random access to the Time/History data which allows the data to be accessed significantly faster than the serial access available on the magnetic tape based DICARPS. 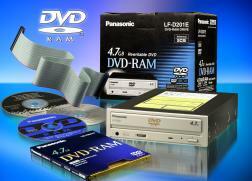 Secondly, the DVD-RAM drive is physically smaller than the tape based DICARPS, and provides a higher reliability too. Running costs can be reduced, as there is no longer a need to service read/write heads after every 50 hours of use. Finally, and perhaps most importantly, the DVD-RAM is fully compatible with music CDs, and offers the ability to play blockbuster movies on DVD, which can be viewed on the Sonar 2031 large LCD panel, and heard via the Curtis Technology SCSI/Audio card. As shipped from Curtis Technology, the unit is not region locked.